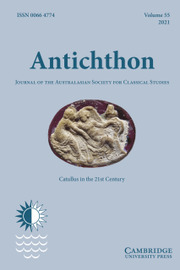 Antichthon is an annual internationally recognised journal of ancient world studies. While it places its main emphasis on Greece and Rome, its scope has been broadly defined so as to embrace the Ancient Near East and the Mediterranean from the beginnings of civilisation to the Early Middle Ages. The journal is open to contributions from any country, and will publish articles on topics relating to the languages, literature, thought, history and archaeology of the ancient world. It will not undertake full-scale reviewing, but may include occasional reviews and articles reporting the progress of scholarship in a particular field of enquiry. The language of publication is English. From time to time special thematic volumes will be published.